In Clapham Terrace School, they are using the 'Roman' books. The teacher introduced the symbol versions of the books to two children, a boy, who was very difficult to motivate and a girl who was Portuguese with huge gaps in English vocabulary. I worked with these two students over a three week period, with two sessions a week. I started by asking them both what they knew about the Romans so that we could refer back to that later. The boy had some understanding of the Romans, but the girl did not. The boy lacked understanding of concepts but loved books. He loved the symbol book. Pauline writes: "I read the first page, then he wanted to read the rest. When I paused to check the vocabulary, he impatiently said 'Let's get on. I want to read this bit'". He loved the pictures and really enjoyed telling us what he knew about them. 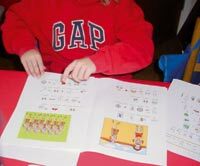 The girl was also engaged in reading the books for a long time and the symbols helped her to join in with the reading. She most enjoyed looking at the pictures as I introduced the vocabulary and was willing to talk about them. She was less keen on reading. In the second session that week both children showed continued interest, and remembered a few of the new terms introduced. 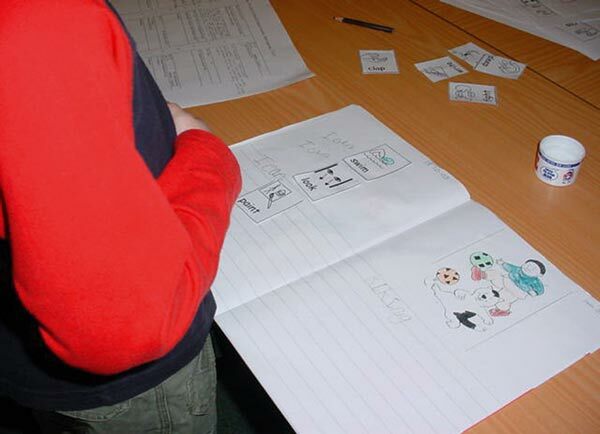 In this session they used the flash cards to identify specific vocabulary and discuss the meanings. By the second week, both children had a good recall of vocabulary and good attention to the tasks. They both made a big effort to recall the labels from last time. The specific vocabulary they could recall was Rome, Emperor, sword, shield, aqueduct, legion and the purpose of turtle formation. By the end of the second week they were able to read from the symbol supported books. These books have symbol/pictures linked to the new and difficult vocabulary. It was clear that the symbols helped them to remember and understand the concepts. In the third week, we introduced a 'Pairs' game using the flash cards. The game was very successful. Before we started we looked at the cards to discuss content. They were very keen to play the game and it encouraged more discussion as we went along. The symbols provided clear motivation and helped with understanding the vocabulary and meanings of terms. Two other children, who hadn't seen the books before, were able to read a lot of the symbol supported text independently.